Sree Kannampuzha Bhagavathy (Bagavathy) Temple is located in Chalakudy, Thrissur dist, Kerala. 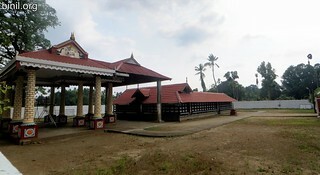 Its one of the most important temples in Chalakudy. Over looking the Chalakudy River, this temple is dedicated to Goddess Bhadrakali, other sub Deities include Lord Siva, Lord Vishnu and Lord Sastha. Thalappoli celebrated in Kumbham Month (Feb- March) is one of the important festivals in this temple, having elephant processions, melam etc, attracts hundreds of people. No one quite knows how old the temple is. The temple has been recently renovated but the Kerala style of architecture is still intact. Below are some of the pictures or photos of this temple. Check out other Bhadrakali Temples in Thrissur.